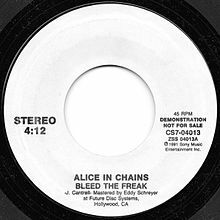 "Bleed the Freak" is a song by American rock band Alice in Chains and the third single from their first album Facelift (1990). The single was released in vinyl format only. A demo version of the song was included on the box set Music Bank (1999). The song is us against the world, those people who put you down: "I put up with many years of you putting us down and watching us bleed, now I'd like to see you bleed some back." Leading up to the release of Live in 2000, footage from a 1990 performance of the song at the Moore Theatre in Seattle was used as a promotional music video. This same performance is taken from the home video release Live Facelift. The song is a fan favourite and was frequently played as an opener for shows in 2006. A live performance of "Bleed the Freak" can be found on the live album Live. The same performance of the song is also included on the home video release Live Facelift. This page was last edited on 25 March 2019, at 03:05 (UTC).